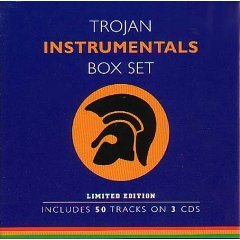 This 3 CD box set is a limited edition from Trojan records. Established collectors will have some of the tracks but not all, includes some great instrumentals. Check out track 12 on disc two which is the only vocal! Informative sleeve notes, however, no details are given as to who wrote them, very good value with 50 tracks in total. Issued on Trojan TRBCD 007-Z UK.